Our sons saw some baby chicks at Tractor Supply and decided they had to have some. My wife and I thought it over and figured that if they ate most of our bugs we wouldn't need to use so much pesticide. We didn't get chicks right away though, we started with some 4 month old pullets. Garin's class is learning about birds and have some eggs in an incubator. 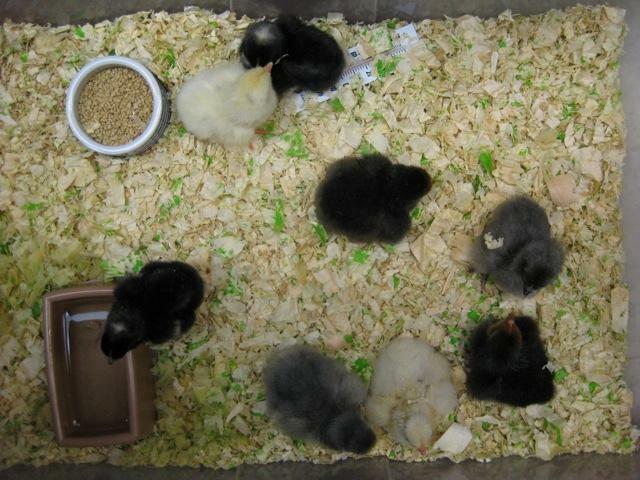 5/19/2009 The chicks have hatched!! I decided to build the chicken run first. It is 7x12 and will eventually get a roof to keep the snow out. The temporary "coop" is a 4x4 snow fort that I built for the kids last fall. They won't need it for a while now. It will be insulated because I am worried about the cold weather. I started with a 6x8 plan, but decided bigger was better. I settled on 8x8.